It has happened. You have done everything you can to defend your law firm from this day, but a hacker has successfully breached your walls. Now, you are faced with your client files being encrypted and inaccessible, lost confidential data, demands for money, the insertion of other forms of malware on your network or, even worse, some combination of these or more malicious activities or demands that you cannot identify. What do you do right now? Complete the form to find out. Cybersecurity researchers at SentinelOne recently reported that 50 percent of organizations have been victim to cyberattacks. Eighty-five percent of those said they had been attacked three or more times. What should you do if your confidential data is illegally accessed? Should you shutdown your computer? Call the FBI? Recover the data from backups? In this new article, we offer a quick course of action post-attack. 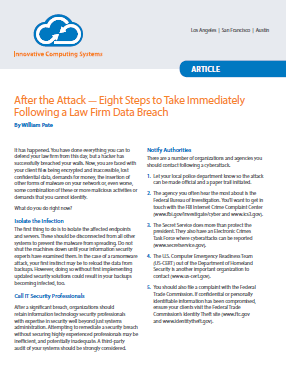 Download it today to learn who to contact and what to do immediately after a cyberattack.